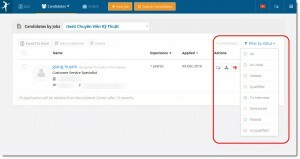 How to access to Candidates list? If you are on the “Jobs” page, click on the “Job Title” or “View candidates” to go the Candidates List Page. The page will show all candidates who have applied to for the job. What do we have on Candidates list page? A drop-down list displays the last 20 jobs. Select a job here, the page will show all candidates applied to that job. To export ALL candidates of a job, Click on “Export to excel” without selecting any candidates.